For her The Frozen Throne statistics, see Lady Vashj (Warcraft III). For information on how to defeat Lady Vashj in World of Warcraft, see Lady Vashj (tactics). Lady Vashj (pronounced /vɒʒ/ — somewhere between Vash and Vosh) was born in the city of Vashj'ir, where her mother, Lestharia Vashj, was the high leader and matron. She somehow left her homeland, and came to the city of Zin-Azshari, capital of the night elves, sometime before the War of the Ancients. Once chief among Queen Azshara's handmaidens, Vashj became one of the serpentine naga when Azshara and her followers were sent to the bottom of the sea during the Great Sundering. Ten thousand years later, Vashj answered Illidan Stormrage's call and followed him first to Lordaeron, where she met up with Kael'thas Sunstrider and rallied his blood elves to Illidan's cause, and then to Outland when Illidan deposed Magtheridon as lord of the shattered world. As leader of Illidan's naga, Vashj and her followers set up a shop in Coilfang Reservoir in Zangarmarsh, where the naga began to pump the lakes into their underground lair. During the Burning Crusade, adventurers invaded the Serpentshrine Cavern where Vashj made her lair and slew the Coilfang matron, her dying breath an apology to her master. As one of the members of the Highborne, Lady Vashj considered it her birthright to serve Queen Azshara. Vashj copied the queen's hairstyle and clothing as much as possible. When the queen made Vashj her foremost handmaiden, remaining in the queen's favor became Vashj's sole concern. She was described as "quite beautiful, with exotic, feline eyes" although she was still not as beautiful as Azshara herself. Lady Vashj as a night elf. When the Highborne were contacted by the titan Sargeras, Azshara was enthralled by Sargeras' vast might. Like the queen, Vashj looked forward to his arrival on Azeroth; both women were certain that he would find Azshara irresistible. The queen did indeed possess amazing charisma, and she doubtless enhanced it with magic. With a quiet word or a mere glance, Azshara could inspire any number of violent emotions; passion and rage were her favorite choices. Driven by sudden outbreaks of jealousy, her subjects occasionally squabbled over her affections and fought duels in the name of her honor. The queen was amused by such displays and did not always intervene to save the combatants from harm. It was precisely this sort of possessive fury that affected Vashj when Azshara and her handmaidens paid a visit to High Priestess Tyrande Whisperwind. Tyrande had been captured by the Burning Legion and imprisoned in the palace. On a whim, the queen offered to make Tyrande one of her handmaidens, but Tyrande politely declined, saying she was sworn to Elune before all others. Azshara was irritated by Tyrande's refusal, however diplomatic, and departed shortly thereafter. Vashj could not forget the queen's offer so easily: the memory became a torment. Despite the fact that Tyrande had refused the queen, Vashj came to see the priestess as a rival for Azshara's affections. Irrationally certain that she had to act, Vashj tried to kill Tyrande, but failed. Vashj then fled the prison cell before her attempt on Tyrande's life could be discovered. Despite the Highborne's attempts to aid the Legion in summoning Sargeras, the portal to the Twisting Nether was ultimately closed before Sargeras could reach Azeroth. The Well of Eternity was unable to withstand the added magical strain, and it began to collapse in on itself. Under the sudden impact, Zin-Azshari and the Well were blasted downward toward the ocean floor. The Well pierced the planet's molten core just before being utterly obliterated. Ancient Kalimdor was split apart, and the seas rushed into to fill the voids between the new landmasses. Azshara, Vashj, and quite a few other Highborne were caught in the rushing waters. Instead of drowning, however, Vashj and many others were cursed and transformed into naga. Despite her subsequent mutations, Vashj has managed to retain her memories and personality. She has also become immortal, and she is not the only naga to receive this unexpected boon. Some time after the Third War, the demon lord Kil'jaeden contacted Illidan Stormrage, who was on Azeroth. Although Illidan had worked against the Legion's interests in the past, Kil'jaeden was willing to give Illidan another chance. If Illidan destroyed the Frozen Throne, Kil'jaeden promised to grant anything Illidan might desire. Accordingly, Illidan sought out new allies. He cast a powerful spell that reached the depths of the ocean, and a group of naga led by Lady Vashj responded, calling in some old Highborne debts. One and all, they pledged themselves to Illidan. The naga did not come because of the history they shared with the former night elf, nor did they respect his demonic power. They came because the Old Gods willed it and they sent them to make sure his campaign against the Lich King succeeded so that it could spark a new war on Azeroth. If the former night elf became troublesome, they could simply command the naga to cut out his fel-corrupted heart. Their first act of loyalty was to facilitate Illidan's escape from Azshara in Kalimdor, and bring him to the Broken Isles and the Tomb of Sargeras. When Maiev Shadowsong confronted Vashj, the sea witch inside of the tomb, she told Maiev that her justice had no place there, and when the warden demanded how she would know anything of the night elven way, Vashj replied by telling that the naga were night elves once. Then she slithered off to join Illidan in the Chamber of the Eye. Illidan and the naga retrieved a magical artifact known as the Eye of Sargeras. To use the eye, Illidan needed additional source of magic. He located Dalaran and sent Vashj ahead to Lordaeron to scout the ley lines. When she arrived, her presence was noticed by the Lich King, who sent the Scourge to the ruins as well. Illidan and naga sorcerers later channeled a destructive spell through the Eye in order to destroy the Frozen Throne. Vashj and her naga were awed by the display of raw power. However, their attempt was thwarted, and Illidan made a hasty retreat to Outland in the hope of evading Kil'jaeden's wrath. Many naga died during the attack, but Lady Vashj and her surviving naga had managed to slip away from the fighting and take shelter deep within nearby Lordamere Lake. Illidan ordered her to find new allies for his army while he would scout Draenor. At Illidan's direction, Lady Vashj and her naga sought out the Prince Kael'thas Sunstrider and his group of blood elves. Kael had been under the oppressive whip of a human general named Garithos, who had sent Kael and his people on missions that any laymen could do while keeping the elves from the front lines. Kael first encountered Vashj when he found his shipyard ruined, and thus his means across the river scuttled. She approached him with an offer of assistance. Kael was hesitant, having fought the naga alongside Maiev at Dalaran—but Vashj insisted, and Kael accepted. Vashj watched Garithos' rage at Kael's dealings with her. But Garithos then sent Kael and his elves against an invading force of undead. Kael was eager to prove himself in battle, but Garithos recalled Kael's support, siege, and cavalry units to the front lines, leaving Kael with a very meager standing force. Vashj felt that the time was ripe to intervene, and so offered her troops to strengthen his own. Kael was again hesitant, but Vashj insisted that it was better to survive than to obey the word of a rash tyrant. Together they defeated the undead forces and recaptured their bases. When Garithos approached, Kael ushered Vashj away, saying he could not ensure her safety. She did, but watched as Kael and his people were taken away in shackles supposedly for betraying the Alliance by siding with the naga. Vashj infiltrated the dungeons of Dalaran through the sewer system and found Kael, killed his guards, and freed him. Vashj told Kael that escape was possible through the remains of the gate Kel'Thuzad had erected to summon Archimonde. She helped Kael escape the jails and kill Jailor Kassan, robbing valuable items from the magical stores as they went, and freeing his people from their cells. Upon reaching the streets, however, Garithos proceeded to assault the portal with his forces. After a perilous defense, they fled through the portal to Outland. When they came through the portal to the shattered landscape of Outland, Vashj explained that it was once the homeworld of the orcs, but the destruction had turned it into the barren, broken waste it now was, and that Illidan was somewhere waiting for them. Vashj and Kael searched fruitlessly for days, until Vashj caught a familiar scent on the wind. Illidan had been captured by Maiev and was being hauled back to her base in a magical prison wagon. Vashj and Kael battled Maiev for dominance, but finally reclaimed the wagon and brought it back to their base, where Illidan was freed. Illidan thanked Vashj for her loyalty, but Vashj gave credit to Kael. Illidan then told them of his plan to rule Outland by overthrowing the current ruler Magtheridon. And so Vashj and Kael defended Illidan as he closed the dimensional gates that supplied Magtheridon with his reinforcements. After they were all successfully closed, Illidan's armies marched on the Black Temple. Vashj and her naga infiltrated the aqueducts and attacked the Black Temple from a side entrance, as Akama and his Broken destroyed the automated defenses. Vashj was responsible for killing the Mistress of Torment with aid from only a few myrmidons and snap dragons for support. Eventually, they battled their way to Magtheridon, and in a titanic battle, defeated him. But Kil'jaeden appeared, and mocked their foolhardy attempt to betray him. He then commanded that they find the Frozen Throne and destroy it. Vashj, Kael, and Illidan went back to Azeroth and advanced upon Northrend, only to be met at every turn by Arthas and Anub'arak, Ner'zhul's prime generals. The battle came down to single combat between Illidan and the death knight Arthas Menethil. Arthas won the fight and warned Illidan to leave the planet and never return. Lady Vashj in World of Warcraft: The Burning Crusade. To this day, Lady Vashj still serves her master Illidan in the wastes of Outland. After Gathios surveyed the defenses of Black Temple and found a weak point in its sewers, the blood elf asked Lady Vashj for assistance. She sent her champion, High Warlord Naj'entus and a small group of naga to guard the sewers. Under the command of Vashj the naga recently have begun to enslave the tribes of the Broken in an effort to bolster the naga's workforce and further their agenda in Outland. Nearly all of the Wastewalker tribe has been captured and put to work to drain the waters of Zangarmarsh. The plan was to take control of all the waters of Outland, and through them, its people. To command the engineers who maintain and operate this machinery, Lady Vashj hired the renowned Mekgineer Steamrigger, a gifted gnome technician whose illness has damaged his sanity. Vashj herself carefully monitors Coilfang's operations from her seat of power within Serpentshrine Cavern. Far more at home here among the waters of the reservoir than locked within the cold stone walls of Black Temple, Vashj maintains a close eye on her minions and personally oversees the draining of Zangarmarsh. Lady Vashj would later partake in the battle that would destroy Warden Shadowsong's forces and result in the warden's capture. During the Invasion of Outland, adventurers invaded the Serpentshrine Cavern where Vashj made her lair and slew the Coilfang matron, her dying breath an apology to her master. After the Sundering ten thousand years earlier, Illidan had taken seven vials containing the waters of the Well of Eternity in order to create a new one at the top of Mt. Hyjal. Illidan used three to create the new Well of Eternity, but it was not known what happened to the other four until recently. It was revealed that Vashj received one of these vials, as did Kael'thas. In order to access the Battle of Mount Hyjal in the Caverns of Time, one must enter Serpentshrine Cavern, Vashj's inner sanctum. 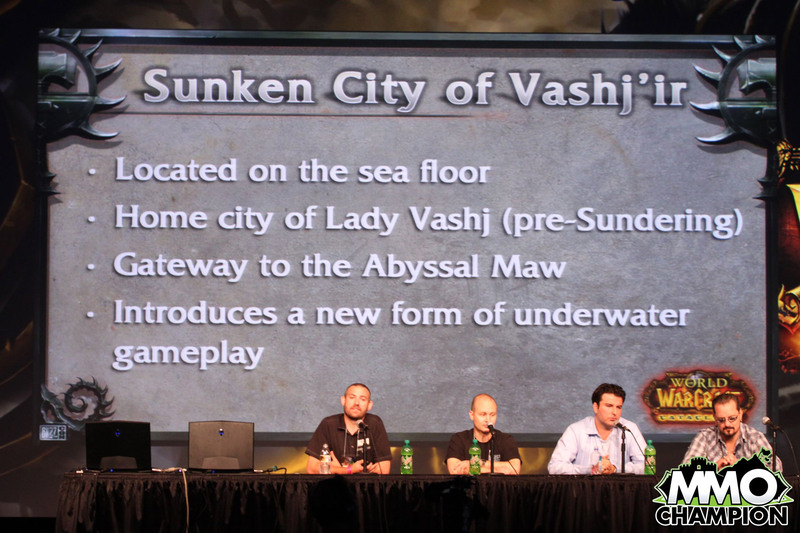 The players must then slay Vashj and take her Vial of Eternity. Since the 2.4 patch Black Temple and Mount Hyjal no longer require attunement. Vashj is a naga priestess. A retinue of naga myrmidon bodyguards always accompanies her. She was a healer and sorcerer in the Warcraft RPG, which made her a shaman and mage in the World of Warcraft RPG. Vashj leans on her combat abilities more than her magic, but she is still a formidable sorceress. She is peerless with her magic bow. She wears Witch's Circlet. Her longbow, Frostfathom, was crafted by the Moon Guard and enchanted by Queen Azshara. Lady Vashj favors wind and water elemental powers when casting offensively. A retinue of naga myrmidon bodyguards always accompanies her. Before her monstrous transformation, Vashj was described as being "quite beautiful". Her clothes were similar to those of her mistress, but lower quality. The only thing that made her stand out from the other handmaidens were her exotic feline eyes. After the Great Sundering, Vashj had turquoise/light blue skin, six arms with long, clawed and webbed fingers, and a long, scaly tail (which she joked about tripping over from time to time) with pink fins. In place of hair, she had about eighteen snakes on her head (one of which was actually a moray eel), which served as her "extra" eyes. Like most other female naga, her face largely retained its elven features, though it had exotic markings on it. Lady Vashj: You've come far enough, little warden. Your vaunted night elf justice has no jurisdiction here. Maiev Shadowsong: What would you know of us or our justice, naga witch? Lady Vashj: Why, my dear, we naga were once night elves! The scene changes to several night elves assembled before a golden statue of Queen Azshara. Lady Vashj: We were Azshara's chosen, the Highborne-- banished beneath the cruel seas when the Well of Eternity imploded around us! The scene changes again subtly. The night elves are twisted naga and the statue of beautiful Queen Azshara now bears a naga's tail. Lady Vashj: Cursed, transformed... we have waited ten thousand years to retake our rightful place in the world. And now, with Lord Illidan's help, we shall! Maiev Shadowsong: Not while I draw breath! Lady Vashj: Your courage is commendable, but it shall avail you nothing. "The human you serve trusts no race but his own. His sense of honor runs no deeper than his tolerance." "I know this hunger, Kael. Like us, your people are addicted to magic! It flowed through your veins for over ten thousand years. And now, with the corruption of your land and the Sunwell that empowered you..."
"This shattered world is called Outland, young prince. It is all that remains of Draenor, the former homeland of the orcish Horde." "We also serve Illidan, old one." Vashj was a night elf priest. Despite originally an Old God servant, it is possible that Vashj switched her allegiance to Illidan over time. The legendary item [Lady Vashj's Grasp] is named after her. Lady Vashj appeared in nearly every campaign within Warcraft III: The Frozen Throne, with The Founding of Durotar being the sole exception. Vashj is a "memory" in the fight against Argent Confessor Paletress in the Trial of the Champion encounter of the Crusaders' Coliseum. Hydromancer Thespia is said to be her childhood friend. Vashj appeared as a villain in Terror of the Tides, a player character in Curse of the Blood Elves, and an adversary in Legacy of the Damned. Vashj never encountered Tyrande in the Third War. Lady Serpentra and Serena Scarscale fought the battles in the Broken Isles, and the force that defeated Vashj at Dalaran was led by Malfurion. Lady Vashj was voiced by Barbara Goodson in Warcraft III: The Frozen Throne and World of Warcraft: The Burning Crusade. Goodson described her as "strong, full of conviction and passionate". Kael and Vashj leading their troops in Hellfire Peninsula. Lady Vashj before the model update. Lady Vashj artwork from the TCG. Lady Vashj deluxe collector's figure. Lady Vashj with Akama and Kael'thas. Lady Vashj on Spoils of War package cover. ^ Borgstrom, Rebecca; Eric Brennan, Genevieve Cogman, and Michael Goodwin. Manual of Monsters, 173. ISBN 978-1588-4607-07. ^ Borgstrom, Rebecca; Eric Brennan, Genevieve Cogman, and Michael Goodwin. Manual of Monsters, 189. ISBN 978-1588-4607-07.